This hotel is 100 PCT Non-Smoking The Homewood Suites by Hilton Amarillo is the most upscale all suite hotel featuring 1 bedroom 2 bedroom suites and studio suites in Amarillo Texas. The Homewood Suites hotel is located just off the main Interstate 40 Hwy with easy access. 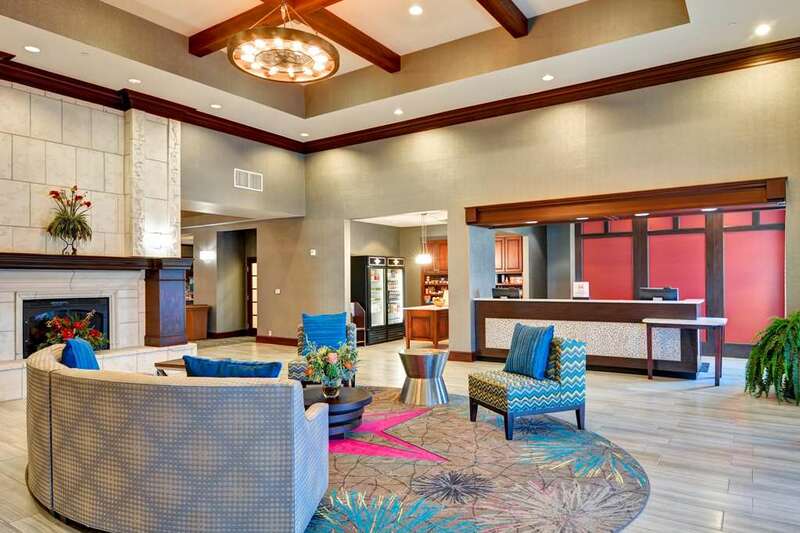 At this Amarillo Texas Homewood Suite by Hilton the lodge and the vestibule have an exquisite French-European decor with stately cathedral ceilings enhanced with the Bose sound system beautiful artwork and a grand piano. At the Homewood Suites by Hilton Amarillo hotel guests can enjoy a large outdoor pool with a magnificent 13 foot lighted water fountain and a cozy outdoor fireplace for a peaceful evening enhanced with soft music. Guests of the Homewood Suites by Hilton hotel in Amarillo Texas will enjoy a daily complimentary Suite Start hot breakfast and the Welcome Home reception featuring a complimentary light meal and beverages Monday-Thursday evenings /subject to state and local laws/. For the guests* convenience wireless and high-speed internet access is also available in the Suites Lobby around the pool and patio area. The Homewood Suites by Hilton Amarillo in Amarillo Texas is within walking distance to the UA Cinema Theater major restaurants and the largest mall in Amarillo Texas and close to the Medical Center. A complimentary shuttle service is provided to the airport from 9 AM to 10 PM Monday-Friday.